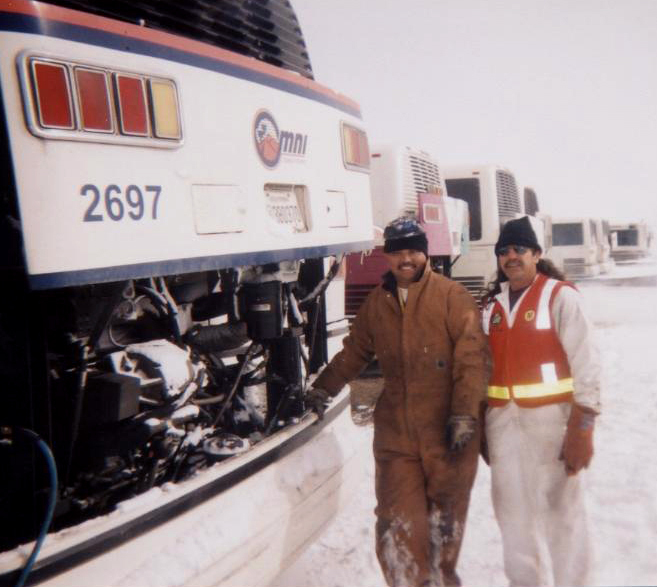 As Olympic champions compete in London, a few Omnitrans employees are thinking back to 2002 and the roles they played at the winter Olympics in Utah. 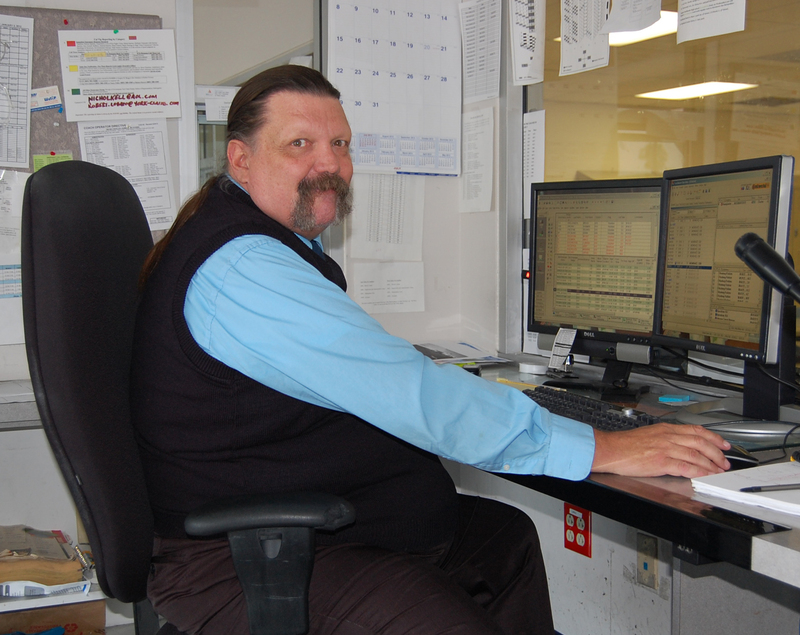 But inclement weather wasn’t about to stop these Omnitrans employees from volunteering when Olympics organizers began recruiting dispatchers, coach operators and mechanics for the winter games. They each jumped at the chance to be part of history! Those who were hired received a special Olympic uniform to keep, complete with a heavy parka, gloves and a hat. In addition to an hourly wage, room and meal allowance, they were also given free transportation to and from events when not working. Veto and the other mechanics arrived a couple of weeks prior to the games in order to get the the buses prepped for travel. 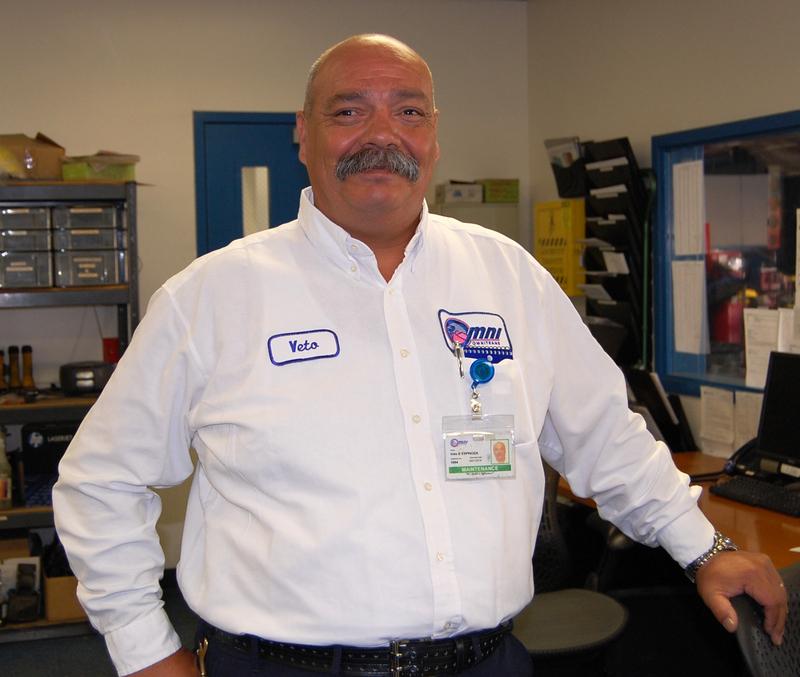 For the most part, the buses were retired vehicles that were donated by various transit agencies, and it was anticipated that they would need a lot of work to keep them running smoothly. 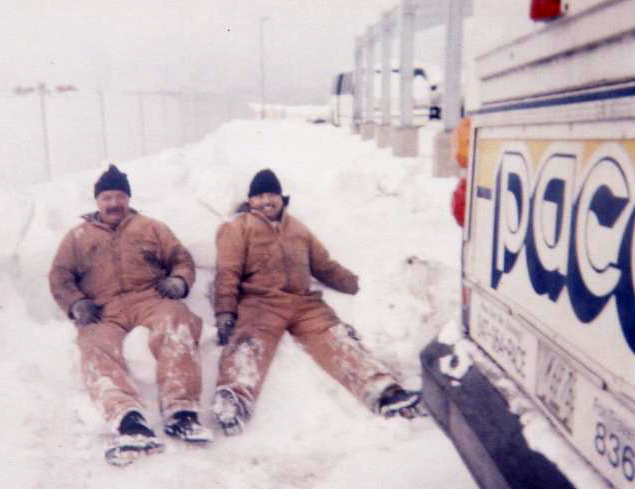 Since the vehicles had been sitting there for a month, the first big challenge was to dig them out of the huge snow piles surrounding them. 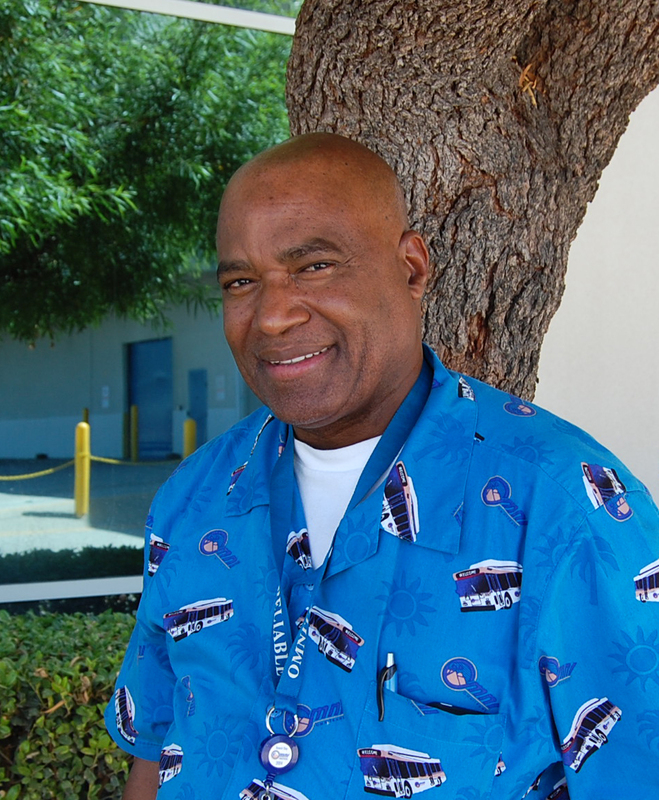 Field Supervisor Dennis Jones drove buses during the event, and was impressed with the efficiency and precision of the organizers. When they first arrived on site, Olympic hires received an orientation on the rules and guidelines for the organization as well as state work requirements. This was followed by extensive classroom training. Coach operators received route training to get them familiar with driving the snowy streets and mountain roads. They were taught just two routes each to prevent them from getting lost. If their off hours, our crew enjoyed meeting people from all over the world. A particular favorite was the Jamaican bobsled team. 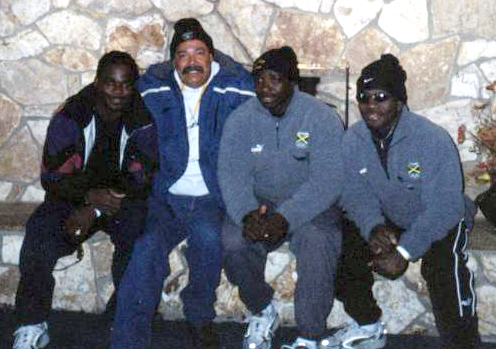 Veto Espinoza and the Jamaican bobsled team. LANE CLOSURE: Traffic control in effect. LANE CLOSURE: Parking and lane nearest the curb along the east side of E Street between 10th Street and 6th Street has been eliminated. Traffic control in effect on east and west side of E Street throughout the corridor. Please note: Properties impacted by water meter relocation activities will receive notification prior to service. Night Work: Mon. – Fri. from 10 p.m. to 7 a.m.
LANE CLOSURE: Traffic control in effect at some locations. 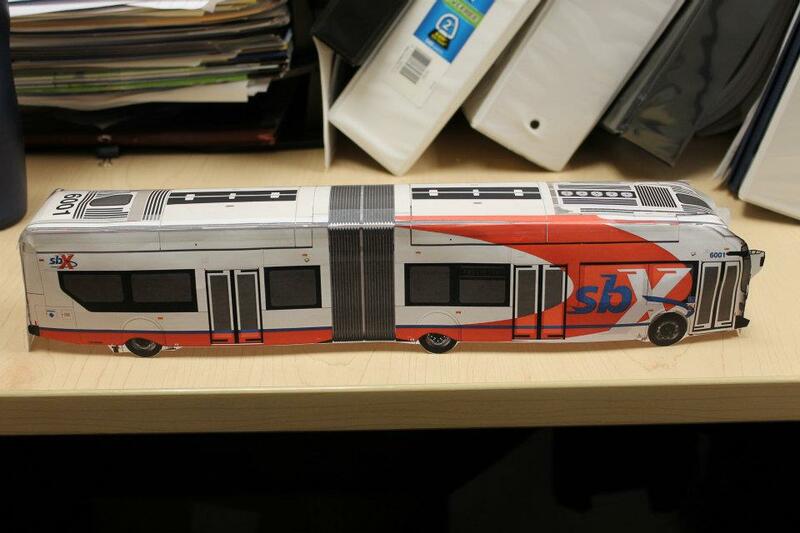 The sbX BRT Project is the first-of-its kind express service to be constructed in the Inland Empire. 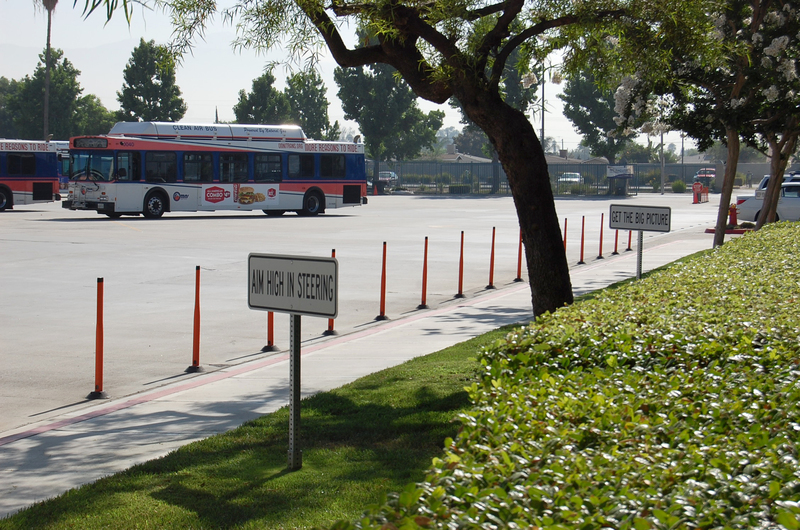 It is the beginning of an intermodal public transit system in the San Bernardino Valley that will help reduce vehicle congestion while providing the public an environmentally friendly alternative that is sophisticated, cost effective, and time efficient. The 15.7-mile corridor spans between northern San Bernardino and Loma Linda. 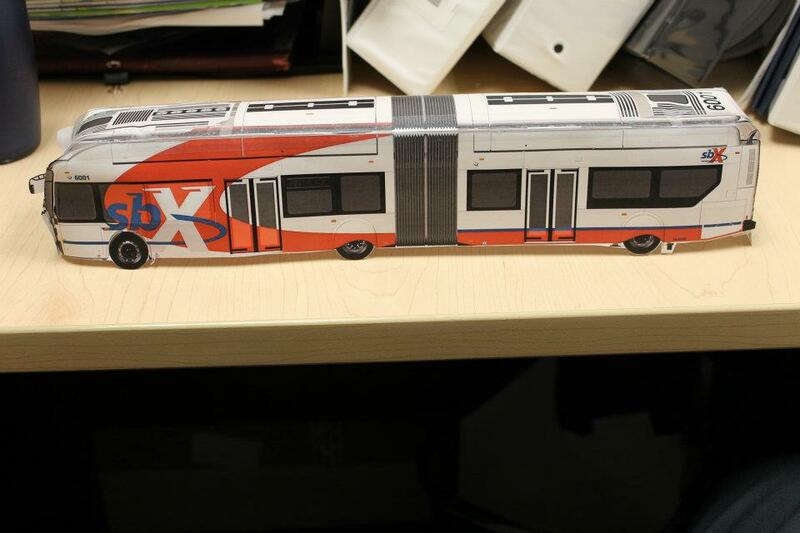 It will include 16 art-inspired stations at key university, government, business, entertainment and medical centers as well as four park-and-ride facilities. 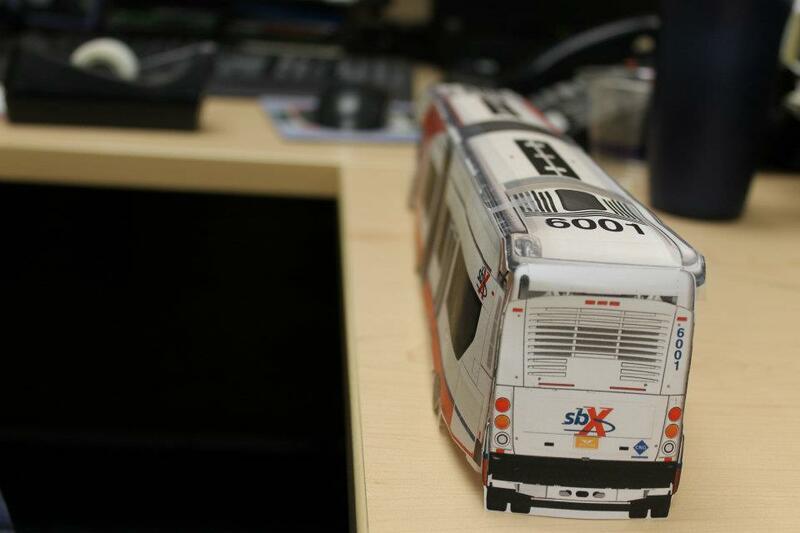 Photos of this paper model shows the paint schemes of the front, rear and sides of the sbX rapid transit bus, the New Flyer Xcelsior 60. Note the advanced air conditioning unit on top; three sets of doors on the curbside; and two sets of doors on the driver’s (platform) side. Click photos for larger view. Route 8 will have to detour due to construction on the westbound trip. Detour is in effect until approximately 3:00 p.m. Please click photo above for expanded view. Several of you were interested in a a closer look at the site plan for the San Bernardino Transit Center, so we’re posting a more detailed version. Keep in mind that these plans are only 15% and are subject to change. 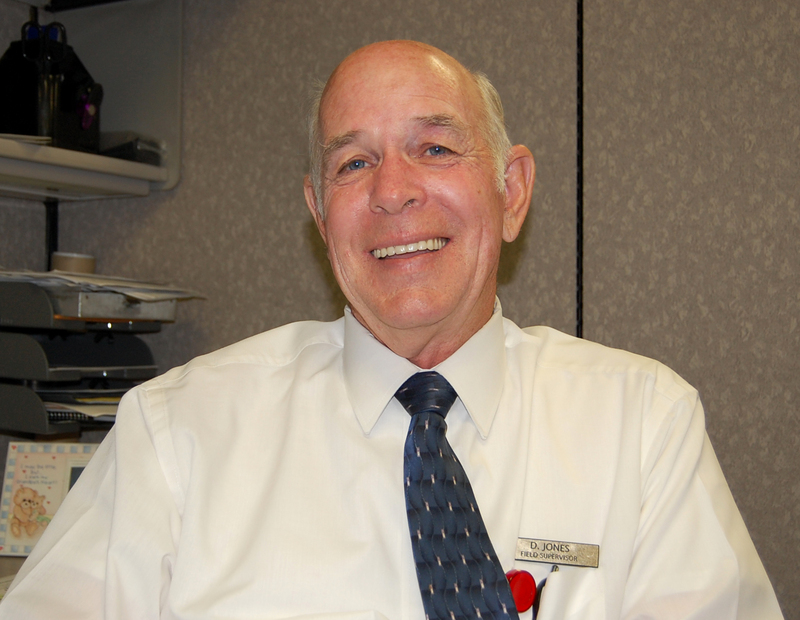 The design and construction is being managed by the San Bernardino Associated Governments (SANBAG). Construction is tentatively set to begin in June 2013. 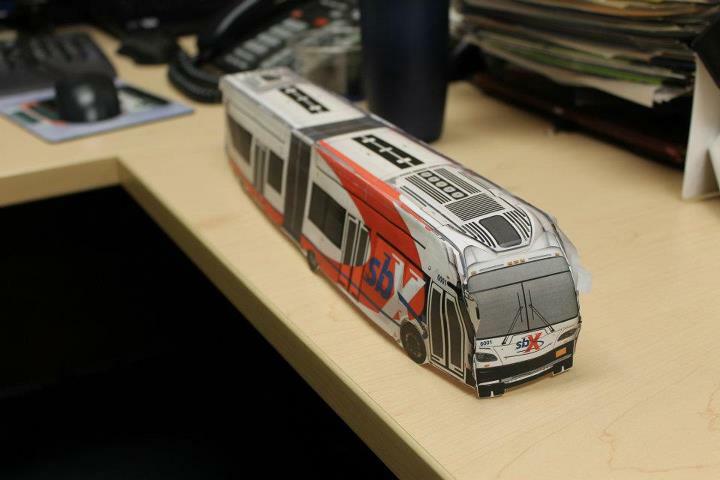 The project is expected to be open by September 2014, but the bus bays will be open by January 2014 for transfers with sbX. 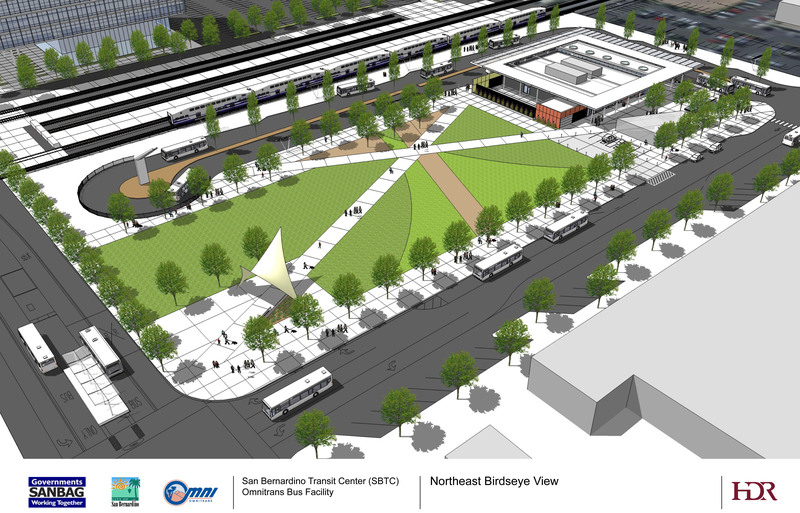 What do you think of the plans for the new transit center? It’s a beautiful day in San Bernardino! Snapped a few photos of the bus yard this morning to share. Click the pictures for a full size view. 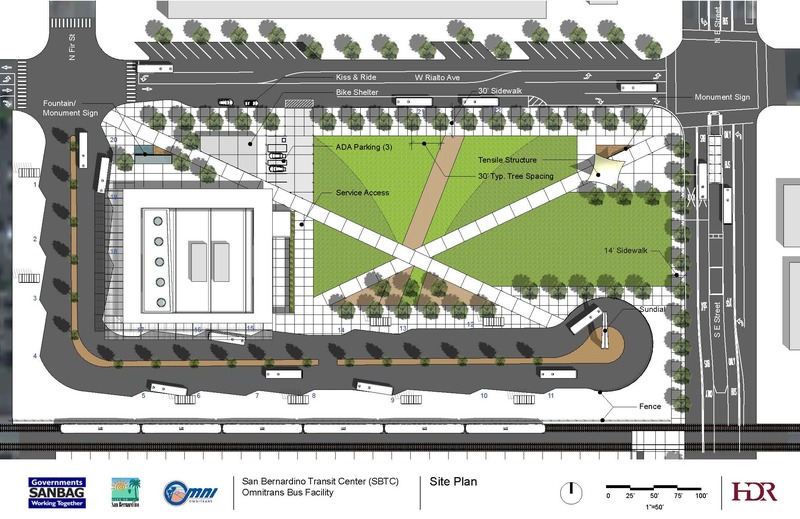 Draft plan for the San Bernardino Transit Center. 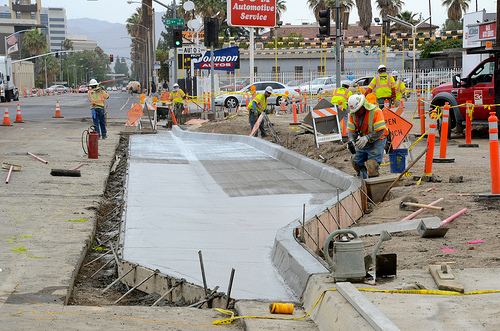 The design and construction of the transit center project is being led by the San Bernardino Associated Governments (SANBAG). 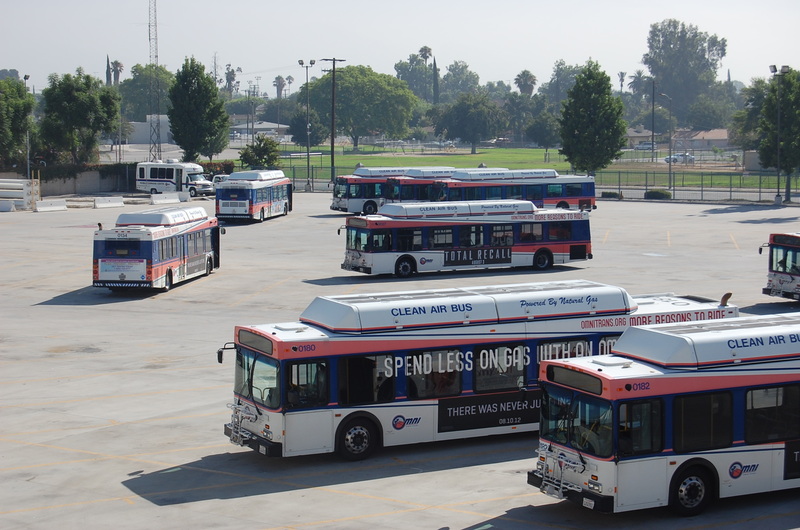 In a press release today, Congressman Joe Baca (D-Rialto) congratulated Omnitrans on its award of a $5.3 million grant from the U.S. Department of Transportation (DOT), for the construction of a new bus facility in San Bernardino, California. 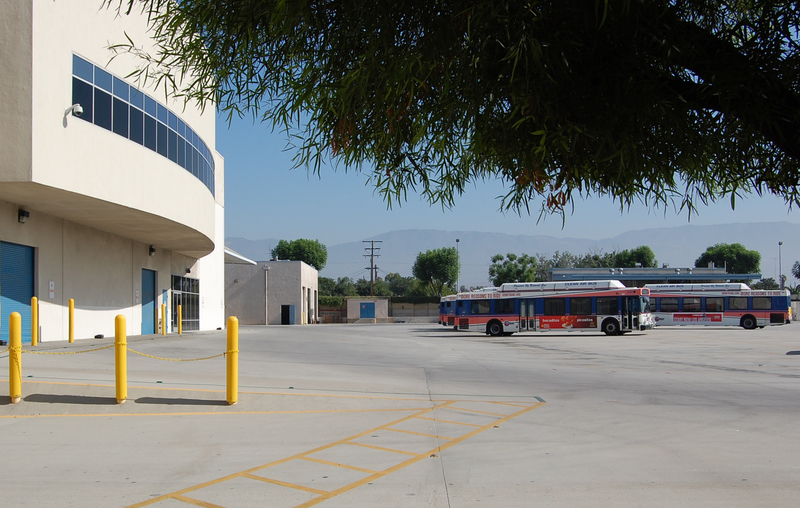 The funding, which is part of the Federal Transit Administration’s Bus Livability grants program, will be used to construct a 22 bus bay complex as part of the San Bernardino Transit Center. 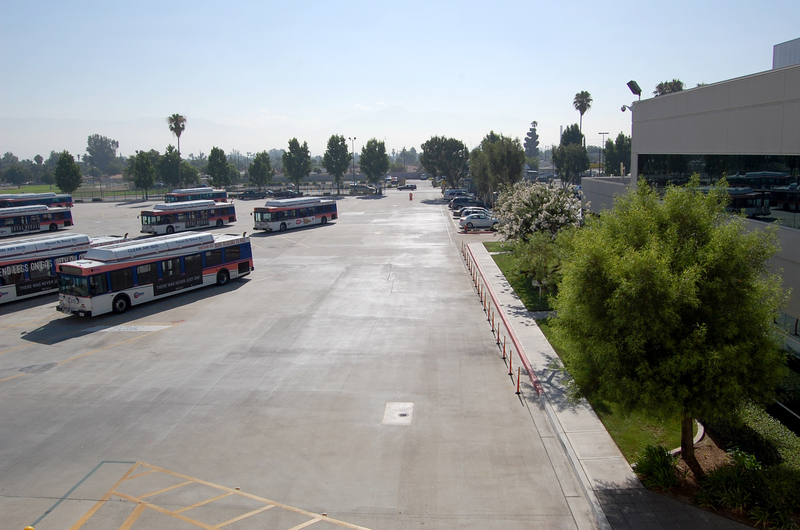 The San Bernardino Transit Center will use the awarded funds to construct a bus facility comprised of 22 bus bays with shelters and real-time bus arrival information for passengers. The facility will also include a transit station building with public restrooms and meeting rooms, a bike station with secure bike parking and short-term rental services, food vending, bike and pedestrian paths, public art, and street improvements. 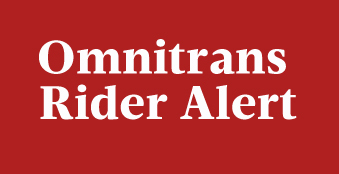 Rep. Baca sent a letter of support to the Department of Transportation in March of 2012, urging the Federal Transit Administration to successfully award Omnitrans’ grant request.